I honestly can’t believe the time has come to return back to work. 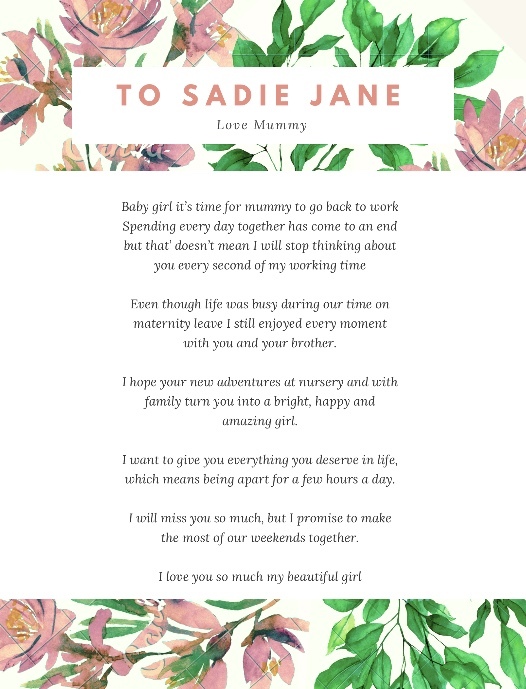 I started my maternity leave in February 2018 and then had Sadie on 11th March (Mother’s Day). I feel the time has flown by and I haven’t made the most of my time with my little lady. When we were at home I would always be running about cleaning or doing mum things or seeing to her brother Sonny who also craved my attention, He’s a mummy’s boy for sure. Its so different second time around. When on maternity leave with Sonny we had lots of time together just me and him and there wasn’t as much mess or things to do when it was just me and baby Sonny. Life just gets so busy when you have two. We had three amazing holidays together. We went to Butlins, Ladram Bay and Devon Cliffs and made some lovely family memories. We moved house in July which meant lots of planning, packing, cleaning, unpacking and change of addresses. This took up so much time of my maternity leave which meant Sadie wasn’t getting the attention she deserved. I really made the most of our last couple of months with Sadie and we attended rhyme time every week at the library and also started to go swimming on Monday mornings together. She absolutely loved going to both of these, she loves being around people. I am going to miss her when I go back to work so much. But I know she will be happy socialising with other children at nursery and hanging out with family on a couple of the other days. I can’t wait to see what she gets up to and things she will learn and explore. I also can’t wait to see the excitement on her face when I go to pick her up each day. I will make sure any days I have off including each weekend are spent spending quality time with her and her brother Sonny. Sadie is such beautiful, bright and happy little girl. I love watching her grow each day and can’t wait to see what the future holds for her. Here's to making lots more family memories in 2019. So again, it’s the beginning of the year. I plan to make some new resolutions for 2019. I want to write them down and see if I can stick with them. I will re visit them mid-year and at the end of the year to see how well I am sticking to them. 1, Eat healthy and get fit. I think this is a popular one for everyone especially after the Christmas period of eating rubbish and sitting down watching far too much TV with the family. I have a gym membership and plan to try and go to classes more after. I have already booked a Pilates class for this week. It’s a little difficult for me to attend classes due to Darren working away. I am also going to try and start eating healthy and follow Slimming World again. I won’t be following 100% percent as I know I will fail. But it’s a great diet to follow to try and get healthy. We have booked a holiday abroad in June so would like to lose 1-2 stone by then. I will also try and walk to more places and at weekends. 2, Meal plan every week, this is just great to be organised as a mum and then it makes the food shop so much easier as well. I want to try out and experiment with new recipes. I also got a new slow cooker for Christmas which is much bigger than my old more, so lots more new recipes for that will be up on my blog for 2019. 3, Deep clean the house every 3 months. Obviously, I clean the house every day but it’s the deep clean that I forget to do. Like pulling the sofas out and hoovering everywhere. 4, Keep up with my blog and YouTube and try and grow both throughout 2019. I would love to get up to 1500 subscribers for YouTube. I don’t expect a massive grow as it has taken me 4 years to get to nearly 900. One step at a time and I like to make my goals realistic. As for this blog I would like to make sure I am putting at least one blog post up each week. Okay I think I will stick to these 4 resolutions as I won’t keep on top of them all if I have too many. These are very similar to last year and I will admit I failed pretty badly at most last year. Which is why I am setting nearly the same goals this year. Fingers crossed I can stick with them. Last year I was a little quiet on my blog. I started the year promising myself I would make an effort on my blog while I was on maternity leave. Turns out having two children makes life busier and also buying and moving house didn't help with having any spare time either. Well Its the start of a new year and I am here making the same promise as last year. I really want to get my blog out there this year and I am going to try and make a big effort with this. 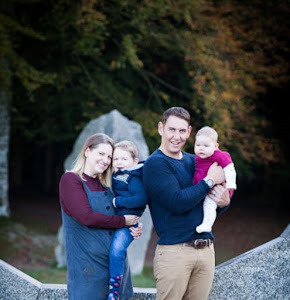 I return to work on 7th January 2019 after having nearly a year off on maternity leave (more on that in another blog post). I plan to post my meal plan every Monday. This is something I enjoy doing and it gets me organised for the food shop and knowing what's on the menu for the week makes life easier as a mum. There will also be blog posts on recipes, mum life, work life, reviews, holidays and much much more. I really hope people start to enjoy reading my blog in 2019, I have been blogging for six years now and I can honestly say I enjoy doing this even though I am not the best writer or the best with grammar but if it’s something I want to do, then I will do it. I am going to think of some new year’s resolutions this week so I will post about that at the end of the week.